A San Francisco Home Theater Transformation! 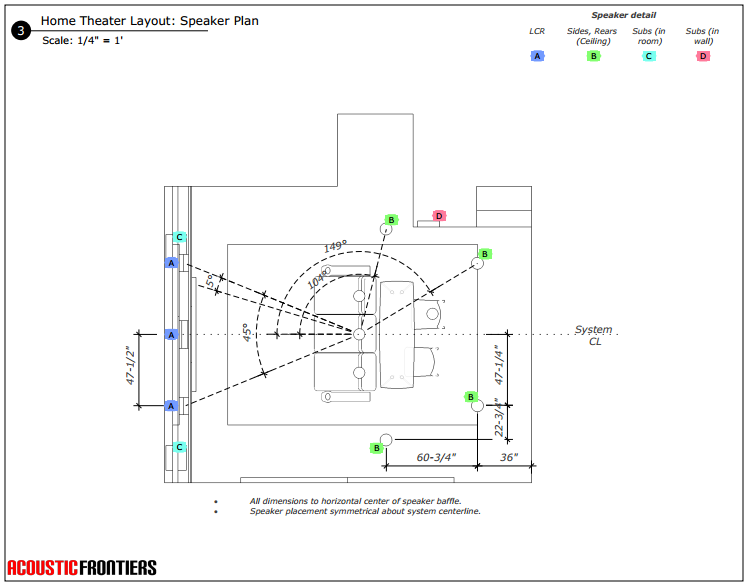 How did Acoustic Frontiers transform a basic surround sound system into a high performance home theater for a client in San Francisco? Read this case study to find out! S.G. works in the Tech industry in San Francisco. S.G. recently moved into a home in San Francisco, CA which had a very basic TV and in-ceiling surround sound system* installed in a downstairs room. [* why does anyone do in-ceiling surround sound systems? It’s NOT the way to do even a basic system!]. His previous home had a professionally designed home theater so he was familiar with the audio and video characteristics that a high performance room should have, and the system in his new home was not giving him that! 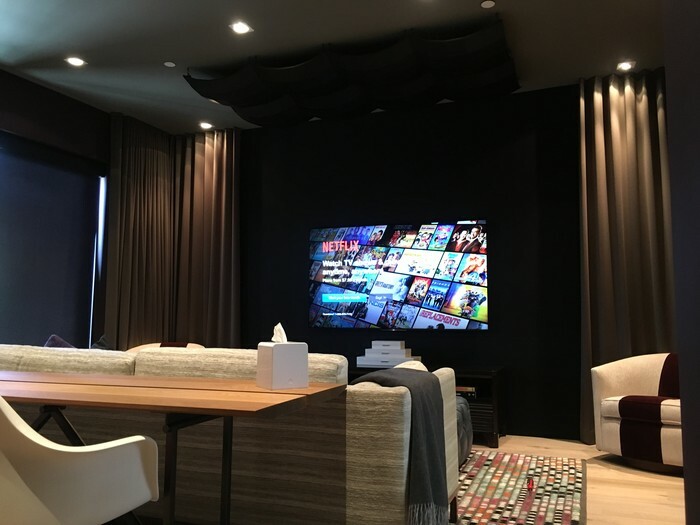 This time around S.G. decided that he wanted a multi-function space that would provide somewhere to play video games, relax, eat food and enjoy TV and movies, rather than the single-purpose focus of a dedicated home theater. With space at a premium in San Francisco and the Bay Area, this is a frequent choice we see people make. Since the client wanted to use the room in the day with the blinds opened we specified a 75″ TV, in this case the 75XBR940D from Sony, their flagship TV at the time. 75″ is about as large as you can go with TVs before the prices increase significantly. 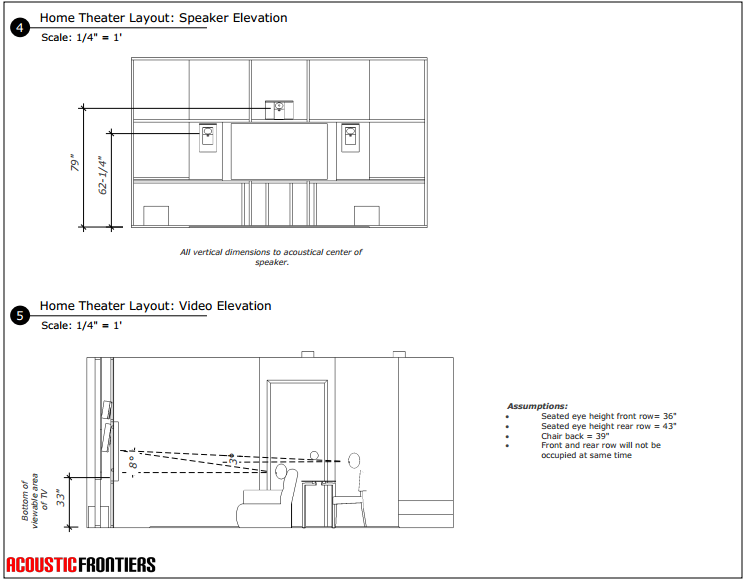 We also designed the room so that the system would work well both from the front couch and from the rear table. The rear table is used for TV dinners. Due to the room layout there was no where suitable to put the side surrounds. Stand mounts were out of the question due to practicality, so we installed in-ceiling side and rear surrounds. The speakers used were Martin Logan EM-IC. We specified three subwoofers to provide even bass response throughout the seating area. Locations were calculated through boundary element modeling. Subs used were JL Audio E110 (2 of) and an Artison RCC640 in-wall. We specified Procella P6 speakers for left, center and right. 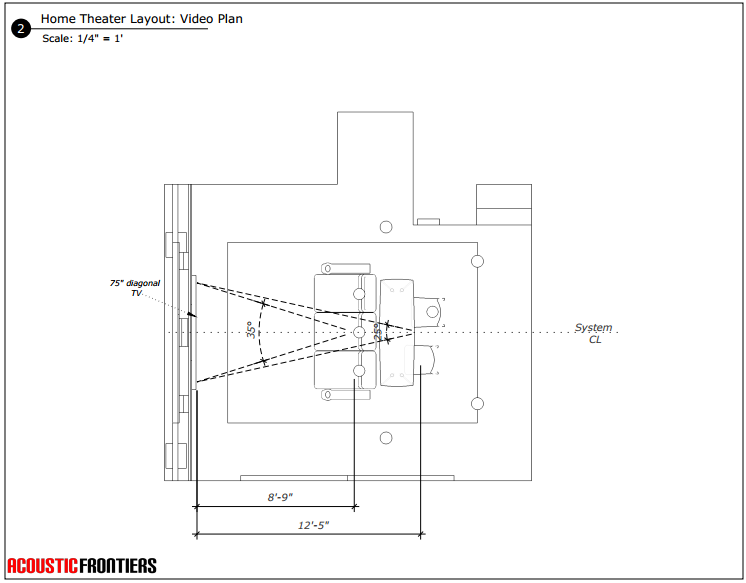 The center was installed above the TV and the left and right acoustical center 18″ below that of the center. All three speakers were angled downwards towards the listening area. 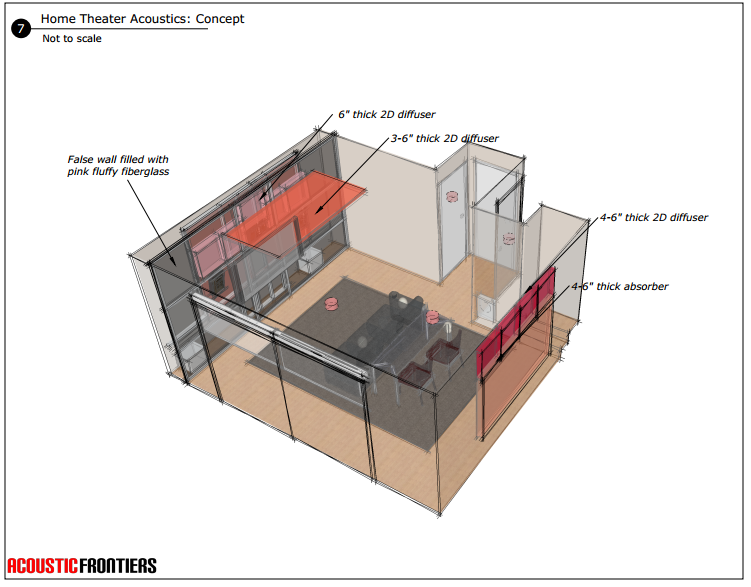 The acoustic treatment design was more complex than usual due to inability to put anything on the side walls, due principally to the sliding glass door on the left side of the room. We filled the area behind the false wall with low density fiberglass batt insulation to provide some low frequency bass trapping. Diffusers were used on the ceiling (ArtNovion Jaya) and behind fabric on the front and rear walls (Vicoustic DC2). Once the room was designed the fun began! New wiring was run from the rack room across the ceiling to the front wall and to the locations of the new in-ceiling speakers. False walls were built at the front and rear of the room per our design. Holes left by the old in-ceiling surround sound system were patched and the whole room painted. Speakers, subs and acoustic treatment were installed in the room and equipment rack mounted. Blackout shades were installed (Lutron battery operated models). New furniture was ordered and installed, together with custom floating shelves and drapes. After installation we calibrated the system to ISF / THX standards for video (including a HDR calibration for the TV) and HAA standards for audio. 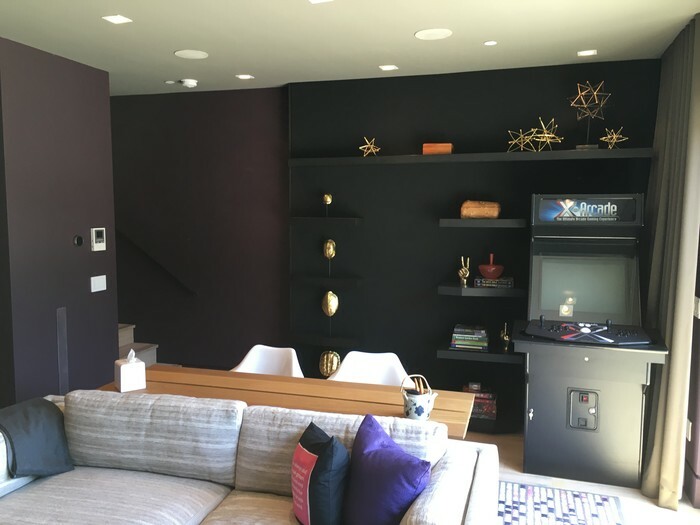 The room turned out really well, and is another great example of our “high performance TV room” concept that has gone down well in the San Francisco Bay Area. Audio / video performance was very good, limited mostly by the practicalities of the room – in-ceiling surrounds, no spatial audio (Atmos / DTS.X) and no side wall acoustic treatments – than anything else. The audio was dynamic, clean and punchy with decent immersion. Video was excellent – these Sony flagship TVs have superb black levels, massive dynamic range and exceptional color accuracy. The High Dynamic Range (HDR) calibration revealed that TVs still have some way to develop technologically before achieving perfection (SDR calibration was perfect). Perhaps the audio would be even better with a higher performance AVR than the Yamaha RX-A1040 used…and about 6 months after the TV was installed Sony announced a new flagship, the Z9D…there’s always something better :). View towards the front of SG’s finished media room! A different view of the front of the media room.